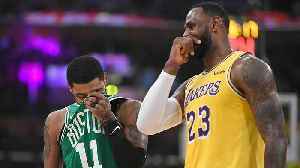 Kyrie Irving recently called LeBron James and apologized for his behavior during their time together with the Cleveland Cavaliers. 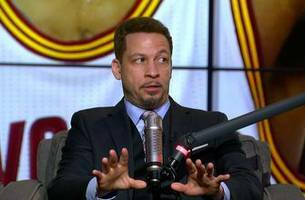 Hear what Chris Broussard thinks Kyrie's call means for the two. Kyrie Irving told reporters on Wednesday night that he recently called LeBron James to apologize for his younger self’s behavior and as it turns out James was reportedly with Kevin Love when Irving called. 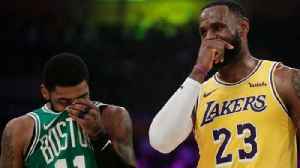 Would Kyrie Irving's Reputation Suffer if He Joined LeBron James, Lakers? 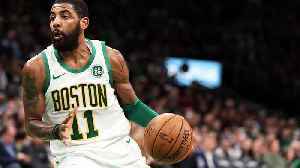 ESPN's Stephen A. Smith recently reported that Kyrie Irving would meet with the Los Angeles Lakers in free agency. SI Now's Robin Lundberg and Amy Campbell discuss if Irving might actually join the.. THE BOYS ARE BACK! Well, they could be! 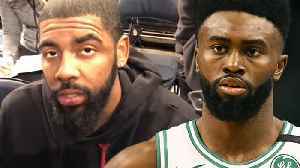 Reports are coming out that Kyrie Irving will “grant” the Lakers with a meeting during the upcoming NBA free agency, but do the Lakers ACTUALLY stand a..
it seems like Kyrie Irving did learn a thing or two from LeBron James during his stint with the Cleveland Cavs and it wasn't winning. there have been talks of Kyrie Irving heading to the Knicks and..
Who Said It: Kyrie or LeBron? In this edition of Crossover TV's "Who Said It? 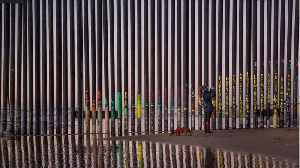 ", Rohan Nadkarni and guest co-host Clay Skipper guess who said the trash-talking quote about their own team. 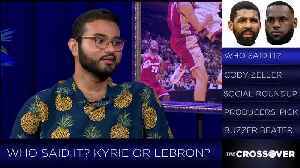 : Kyrie or LeBron?